Make Self- Care Your #1 Priority: Before you even consider dating anyone, you must first make a practice of being kind to your self on a daily basis. This self-care can be as simple as taking a break to call a friend or go for a walk. Or you could treat yourself to an extravagant splurge like a new outfit you’ve been wanting. Whatever it is, keep in mind that when you are taking care of yourself, in big and small ways, you become less willing to tolerate others in your life that will not treat you kindly. By setting the standard of how you want to be treated, you will be more likely to attract someone that will respect those standards. Pay attention to the people and activities that bring you joy and highlight your best qualities. You are naturally more attractive when you are doing something you love, and the people you meet while you are enjoying yourself will recognize your enthusiasm for life. Your passion and personality will shine through and you will be instantly more attractive. Take Your Time: It’s tempting to immediately run out and date anyone with a pulse after separating or a break up. But, what’s the rush? Yes, it’s been a long time since you last dated and you are eager to see what opportunities await you. However, when you make quick decisions in dating, the frustration and emotional damage that result can cause you to burn out just as quickly. Taking time to really assess your wants and your needs in your love life will result in a more fulfilling dating experience. Give yourself the pleasure of being selective. You will be so much happier knowing that you chose quality over quantity, and you will boost the chances of attracting someone worthy of your time. Set New Social Goals: It can be very tempting to isolate yourself following a divorce or a break-up. It can be hard re-adjusting socially, especially if your ex has claimed some (or all) of your mutual friends. If you find yourself in a rut, why not incorporate some new goals for your social life? You can start with taking baby steps– adding some new people to your social circle. Set a goal to make one or two new friends each month and by the end of the year you will know 12 to 24 new people! Go beyond connecting just on social media. Invite the new friend to coffee, lunch or out for drinks to have a chance of really getting acquainted. Find common interests and use the new friendship as an opportunity to explore new hobbies. Remember the bigger your social network, the better your odds to meet someone to date. If you feel that your social network is already big enough, another possible goal might include reconnecting with the friends you already have. Host a monthly or quarterly event or set a goal to contact one friend each week simply to catch up. Most people will be happy to hear from you if it has been a while. Taking the initiative to stay in touch will help your friends feel appreciated. As you reconnect with your friends, remember to share your dating goals in case your friends know anyone suitable they would like you to meet. Wardrobe: Take an afternoon to go through your clothes and shoes. Get rid of anything that no longer fits or is not in style anymore. If it is not something you would feel comfortable wearing when meeting a new potential mate, you probably need to get rid of it. Fitness: Step on the scale (EEK!) and take a look in the mirror. If you are not happy with what you see, commit yourself to making some changes. This is not about meeting unrealistic societal standards. This is about reflecting your best self. Make some small efforts to reach your own fitness goals. It could mean joining a walking group or hiring a trainer to help motivate your workout. Take the plunge and commit to doing whatever you need to do to help you feel comfortable with your health and physical appearance. Hygiene: It should go without saying, but no one wants to be involved with someone that is not taking care of his or her basic hygiene. Take pride in looking (and feeling) clean every day – whether you are dating someone or not. You should not be out in public or associating with others if you can’t manage the basics. Clean skin, hair, nails, etc. not only give you a polished look, but also make you more confident and attractive to potential suitors. Smile: Make it a habit to smile more. Research has shown that the hormones released when you are smiling elevate your mood. So, even if you aren’t in your happy place, smiling will help you get there. Fake it til you make it! In addition, smiling will get you a smile in return from the people around you. Smiling is universally attractive and you are making yourself more approachable when you smile. 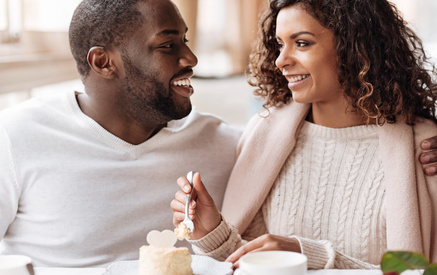 Whether you’ve recently separated, been divorced for years, or coming out of a long term relationship, stepping back into the dating scene can be challenging but it is definitely worthwhile. You are already equipped with all you need to make great things happen in your love life. Your new enthusiastic mindset, upgraded sense of style and expanded social network will set you on the path to adding love to your life.